With 60% of user having abandoned carts solely due to extra costs added during checkout – shipping costs is clearly still a weak point of e-commerce (Baymard 2018). It should therefore come as little surprise that Store Pickup is becoming an increasingly important feature in e-commerce, with as many as 50% of all customers expecting omni-channel retailers to offer this option. Alas, our usability research shows that users often overlook Store Pickup features on many of the sites where it’s offered due to a mismatch between where users expect to find the feature and where it’s typically located on the site. During our large scale mobile commerce usability study, for example, 83% of the subjects testing REI’s mobile site overlooked the “Find in Store” button on the product page (see above image). Instead the subjects would look through shipping policies, FAQs and – most notably – in the shipping selection section during checkout to find Store Pickup features and information. Similar observations were made at the other tested mobile sites. 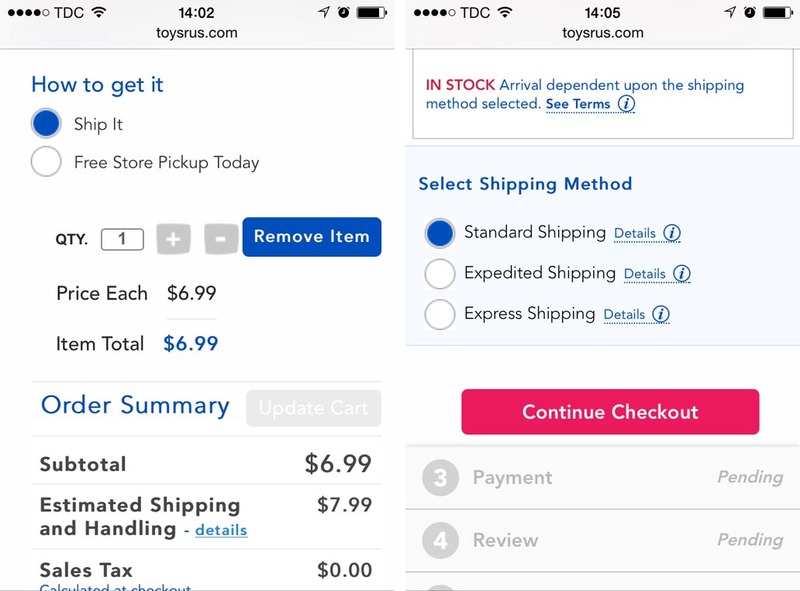 Even though Toys’R’Us offers Store Pickup the user has to select between a “Ship it checkout” and a “Store pickup checkout” at the cart step. 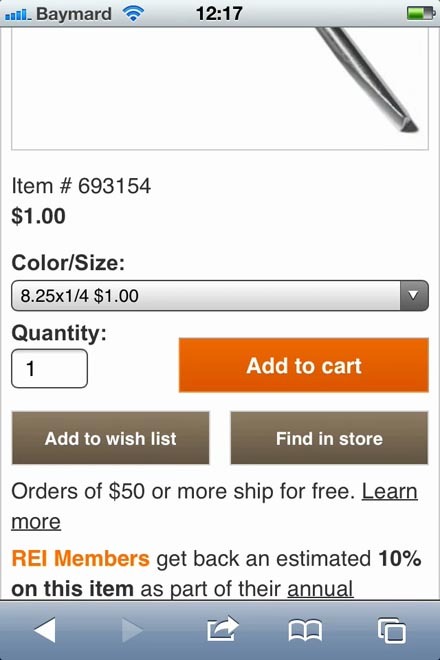 On mobile this breaks some users’ expectation of where to find the Store Pickup feature, and it fails to remind the customer of one of the benefits of shopping with an omni-channel retailer. A common implementation found on most e-commerce sites is to provide the option for Store Pickup either before checkout or as the very first thing during checkout. While this is great as it potentially allows the user to bypass the entry of their address details (if they complete a Store Pickup order), our usability tests found that only displaying the Store Pickup option here breaks user expectations as many expect it to be part of the delivery method selection. It’s therefore important to (also) include the Store Pickup option as a shipping method during checkout. As seen on the left hand, REI didn’t display their Store Pickup option alongside the shipping options. 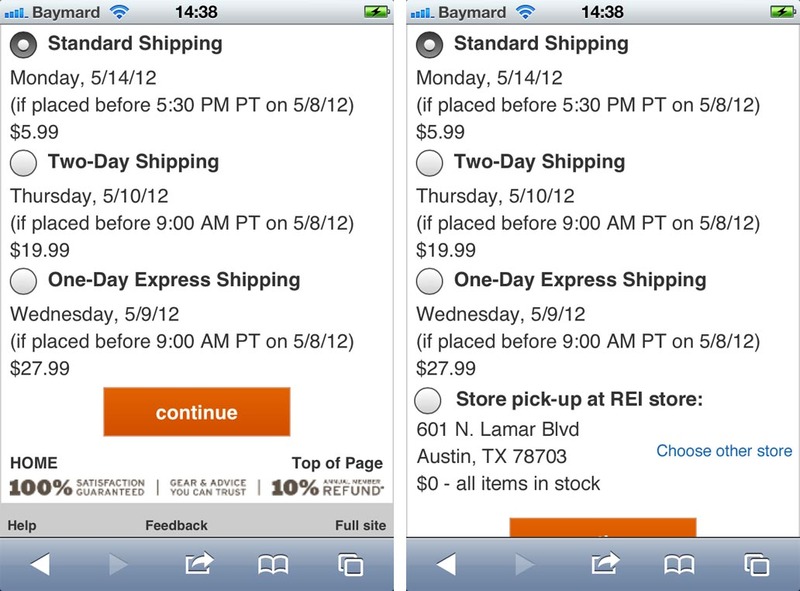 On the right hand you see a mock-up we’ve created illustrating how Store Pickup could have been integrated. Since the ordered items, and in most cases also the user’s zip code, is already known (since it’s during checkout) you can do an automatic availability lookup of the cart contents at the store closest to the provided zip code. In terms of the user’s checkout experience, this makes suggesting Store Pickup as a shipping option nearly frictionless – the user doesn’t have make an active decision of whether they want to do a “Store pickup checkout” or a “Ship home checkout”, they don’t have to make any selections, nor confirm anything to get the Store Pickup option presented. Even though you may not actually be shipping the order (but rather e.g. pick it off the shelves), most users will see Store Pickup as an alternate shipping method, and it’s therefore important to display it as an equal option, and not as a separate checkout flow or delivery tab. This makes comparison easier for the price-conscious user, allowing them to compare the hassle of going to a store vs the cost of sticking with the cheapest shipping option. By displaying Store Pickup as a regular shipping option, Zara ensures that their users know they have the option to ship and pick up the order for free in any of their stores. The timing is essential here, with Zara presenting the Store Pickup option to users exactly at the point when they often have second doubts about their order because of the added shipping costs. Especially when users are only ordering a few fairly cheap products they are more likely to have second thoughts once they see how much the shipping costs will be relative to the total order amount (e.g., $10 shipping for a $25 item). In fact, we recently commissioned a survey with 1,500 respondents for our checkout usability report which revealed that 33% of those who had abandoned a checkout process during the last two months had abandoned due to extra costs being added to their order (such as shipping cost, taxes, or fees). This is the exact reason why Store Pickup should be displayed side-by-side the regular shipping options – so it can act as a permanent free shipping option, allowing users to avoid such extra costs. Smart omni-channel brands should seek to leverage this strategic advantage they hold over pure online retailers. By framing Store Pickup as a “free shipping method” available for even the smallest of orders, an omni-channel’s online store can put forward a much more attractive and competitive offer compared to their pure online counterparts, while simultaneously drawing customers into the omni-channel’s physical stores (as customers go to pick up their items). In other words, Store Pickup can essentially bolster business in both the online and physical stores of the omni-channel brand. But that’ll only happen if users are presented to the Store Pickup option at the right time and in the right context. 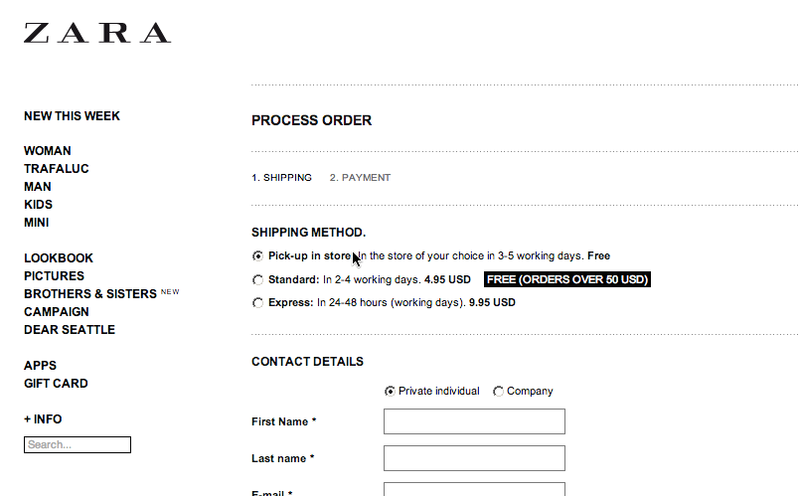 The shipping method selection during checkout is one such combination. Authored by Christian Holst. Published on April 2, 2014.